What is a CNC Plasma Cutter? - Machinery Resources International Inc.
A plasma cutting torch is a tool most commonly used for cutting metals. While purposes vary, the hand-held plasma torch is ideal for cutting quickly through metal plates, bolts, pipes, sheet metal, or straps. They are also perfect for gouging, whether back-gouging or the ability to remove poor yields. You can also use a hand torch for cutting small shapes from a larger piece of steel. However, accuracy is lacking, and it is virtually impossible to achieve a quality edge in most cases. Accuracy is improved with the update to a CNC plasma cutter. This system consists of a machine that includes a plasma torch. The plasma torch can move by a computer’s directions. CNC stands for computer numerical control, so a computer controls a CNC machine. These mechanized plasma cutters are made to operate as an electric torch and plasma system. While some CNC plasma cutters include hand-held torches, those more properly made for mainstream manufacturing will be primarily mechanized. CNC plasma and flame cutting systems consist of several important parts. The controller has an interface panel and a console specifically designed for the CNC machine. It could also be as simple as a laptop used to run a software program designed to communicate with the device. Entry level machines typically use this simpler method. The torch moves on directions set forward by the CNC to cut the parts from a steel plate. Generally known as m-codes and g-codes, this text describes the part’s dimensions, and when the torch will turn off or on. Post processors are programs that help translate codes into the codes read and implemented by a CNC machine. A mechanized plasma cutter requires a drive system as well. This system consists of encoders, cables, amplifiers, and motors. At least two engines are included, depending on the needs of the machine. Each motor has a drive amplifier that takes a lower power signal from the controls, and this turns into a high-powered signal to move the engine. Each axis needs a feedback mechanism – an encoder – that indicates how far the axis moves. Feedback is retaken to the CNC via signals to the drive system and actions are measured and corrected every few milliseconds. The last part is a type of electrical system that regulates inputs and outputs. It allows the CNC to turn on the plasma appropriately. Finding quality machinery for your company is important. 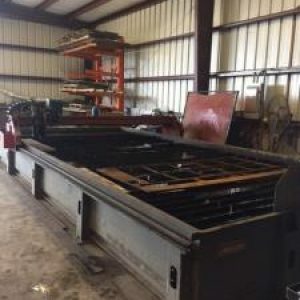 When it comes to finding the best CNC plasma cutter for sale, choose a company with a combined 60 years of experience in the industry: Machine Resources International. As an experienced dealer offering high-quality pre-owned machinery to the worldwide manufacturing industry; from simple to more complex, MRI’s expert team will help you find the machine that works best for your business’ needs.